Le premier quatuor, commencé en 1927, achevé en 1941, et publié seulement en 1991 par Eschig, a déjà toutes les qualités de la musique de Sauguet, qui disait : « Être simple en usant d’un langage complexe n’est pas facile. Il faut écouter le conseil de Rameau qui prescrivait de cacher l’art par l’art même et croire avec Stendhal que seules les âmes vaniteuses et froides confondent le compliqué, le difficile avec le beau ». 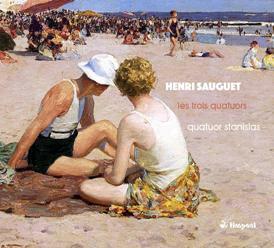 Le deuxième quatuor (1948) est certainement le plus connu, car il avait fait l’objet d’un enregistrement du Quatuor Parrenin dès 1954. Dédié à la mémoire de la mère du compositeur, il dégage un charme particulier, entre sourire et larmes, et la valse du troisième mouvement représente la quintessence de ce que la musique française a pu offrir de plus raffiné au XXème siècle. Ecrit trente ans plus tard, le troisième quatuor présente un caractère plus épuré et abstrait, comme si Sauguet avait voulu prouver que lui aussi pouvait écrire une musique « sérieuse » ! sur l’expressivité discrète et les impondérables du son et de l’harmonie. For those unfamiliar with the name Henri Sauguet, he was born in Bordeaux in 1901. It was at the instigation of Darius Milhaud that he moved to Paris in 1921, where he became closely associated with ‘Les Six’, becoming the ‘honorary’ seventh member. His music is, on the whole, tuneful, tonal and well-crafted, incorporating influences of the Montparnasse group, and seasoned with a dash of Satie and Stravinsky. Although his output was prolific, with operas, ballets, four symphonies, concertos, chamber, choral music, songs and film music to his name, his music is largely forgotten today with the possible exception of his 1945 ballet score Les Forains, one of over twenty he composed, whose subject is a travelling circus troupe. Forgotten Records have issued a couple of CDs featuring his symphonies, which I reviewed last year. Sauguet composed three string quartets at significant milestones in his life - youth, middle and old age, aged 26, 47 and 78 respectively. This is their first outing in the studio, apart from a 1954 recording of No. 2 made by the Parennin Quartet and available on a 10-inch Vega LP, but not yet transferred to CD, so this new release is most welcome. The First Quartet dates from 1927, though the composer put some finishing touches to the score in 1941. It was premiered by the Lespine Quartet. The aim of the opening movement is to charm and delight, with Sauguet serving up generous helpings of captivating melody. The whole movement is based on the motive of an ascending scale. A sprightly Scherzo follows, whose outer energetic sections frame a central trio, largely elegiac with traces of wistfulness and regret, perhaps hinted at by the choice of the F sharp minor key signature. The slow movement is the least successful, a yearning melody set against pulsating semiquavers. It gets a bit bogged down with the inspiration level slightly below par. The finale employs a confident fugue, and ends the work in positive mode. No. 2 is the only one of the three to have gained some recognition, having one commercial recording to its name, as I have already mentioned. It’s a deeply personal work, composed in 1948 and dedicated to the memory of the composer’s mother who had died the previous year. The first movement paints a picture of her – chatty, engaging, cheerful yet with a wise, guiding hand. It’s an intimate movement where he mourns her passing. This sombre threnody reveals that the pain is still raw, with dissonant harmonies sounding like sobs. The beautiful pianissimo sonorities towards the end are reverential and prayerful. Yet, it is not all sadness, and in the third movement Sauguet recalls happy memories of times past in the Tempo di valse. The final movement once again echoes the sense of loss he is experiencing and hearkens back to the sentiments of the slow movement. Loss and bereavement also lie at the heart of the Third Quartet; this time it was death in 1977 of his companion, the painter-decorator Jacques Dupont. Sauguet was 79 when he composed this, and his music had become more advanced, adventurous and daring. This time he structured the work in three movements. The restlessness and unease of the opener give the movement a loosely tailored construction, with no real centre of focus. The intimate slow movement is imbued with calm and serenity. The final movement is again, like the first, loosely tethered with a proliferation of motifs juxtaposed. There’s a wonderful, still calm to end the work. This release should appeal to those, like myself, who have an interest in off-the-beaten-track French chamber music. The Quatuor Stanislas have an appreciable empathy for this music, and their well-recorded performances are rife with detail and overflow with ardent lyricism.